MITZPE RAMON, ISRAEL–Our final stop on our geological tour today was close to our temporary home: on the northern rim of Makhtesh Ramon (N 30.62831°, E 34.81759). Exposed here is the En Yorqeam Formation (Upper Cretaceous, Cenomanian), seen above as the less resistant marly unit between two resistant limestones. I did my first presentation on Israeli geology with bored and encrusted oysters from the En Yorqeam, which were also the subjects of a Fossil of the Week post. We visited this outcrop today because there are some stratigraphic questions about its thickness and distribution. Its rich fossil fauna has also not been described in detail. This would be an ideal Independent Study project someday, especially with one large outcrop so close to our headquarters. 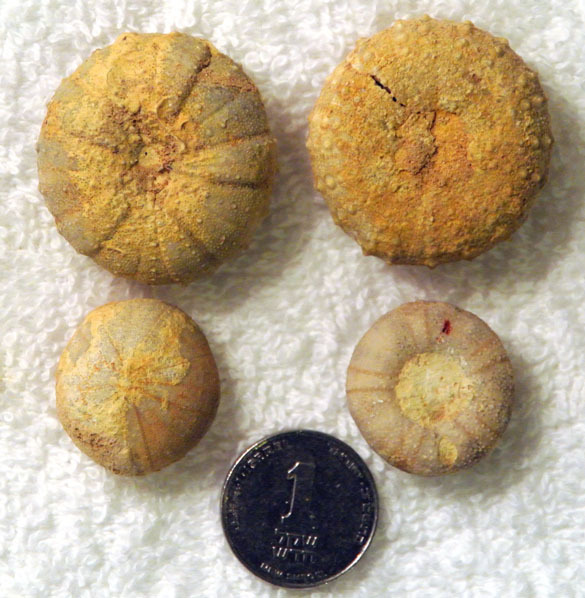 Echinoids are the stars of the fossil fauna in the En Yorqeam. In just ten minutes we picked up over a dozen well preserved specimens. The large ones at the top are Heterodiadema lybicum. I don’t know the identity of the two in the bottom row. I bet some sharp student, though, can come up with the names quickly! MITZPE RAMON, ISRAEL–Our third stop in our geological journey today was 19 km north of Mitzpe Ramon (N 30.76084°, E 34.72020°) at another outcrop of the Matred Formation (Middle Eocene). We again had silicification, but no corals this time, The silica replaced the original limestone in a very strange way, producing these dark rings. Since silica is harder than limestone, the surrounding unreplaced limestone erodes faster, leaving the silicified rings in relief. They look anthropogenic, but they’re entirely natural. Again, mysteries abound. 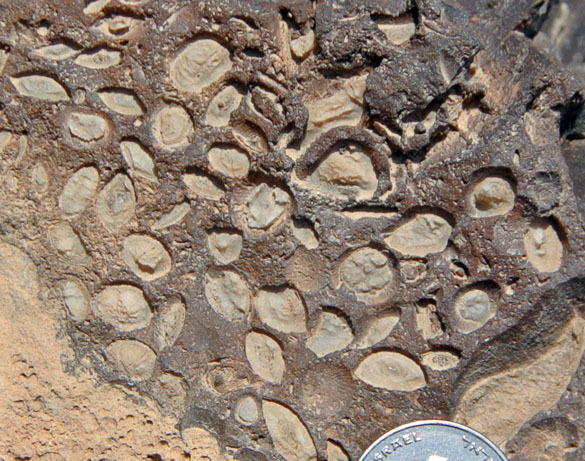 In this close view of the silicified limestone are numerous bivalve shells that were replaced with silica just like the matrix. They appear to be a random distribution of shells with no preferred orientation. There are two fossils here replaced with silica. We’ll let the readers guess what they are. These curious rings of black rock on the top of a hill attracted local peoples. 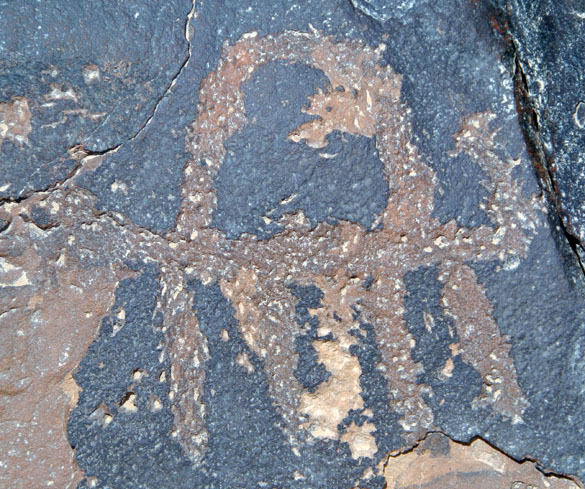 Over the centuries (no one knows exactly how many or when) they carved numerous petroglyphs through the patina on the rock surfaces. We will also entertain guesses as to what is represented here! MITZPE RAMON, ISRAEL–Our next stop on this day of exploration was 32 km southeast of Mitzpe Ramon at outcrops of the Matred Formation (Middle Eocene). The location is N 30.36899°, E 34.98655°. Look at those coordinates on Google Maps and you’ll see that they are from the peak of that black mountain on the right of the above view. The black color is from the weathering of thoroughly-silicified (infused with silica) coral-rich limestones. Ordinarily paleontologists tend to stay away from such preservation because the matrix as well as the fossils are coarse, hard chert. These fossils, though, are important because they give strong clues about the depositional environment of the sediments. In this case, in situ coral reefs mean shallow water. This is what the silicified corals look like in this part of the Matred Formation. We are looking down on the top of a colony. 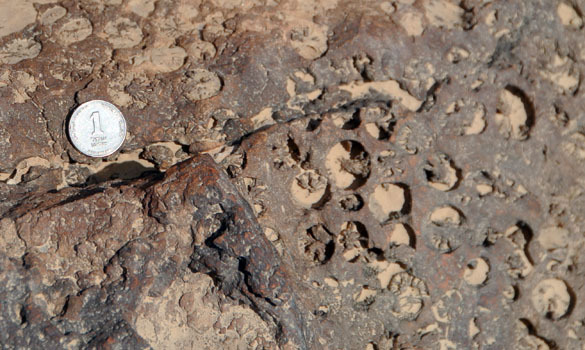 The holes represent the original corallites. Material like this cannot be identified to more than the family or genus, but we see enough to know that they are corals. 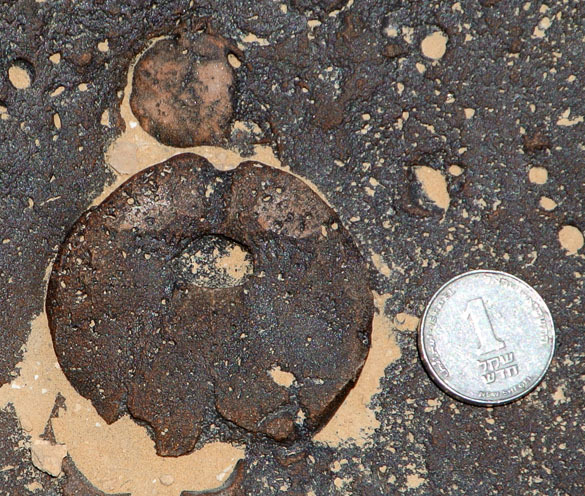 In this piece the bean-shaped fossils are large benthic foraminiferans that still retain their original calcareous skeletons. The matrix around them has been silicified. This type of preservation remains a mystery, especially when in the same unit we see the same fossils have been silicified and the matrix is not. More geological puzzles! This wadi near the site is so beautiful I wanted to include an image. This would be a fun place to work, although maybe the spring would be more hospitable! 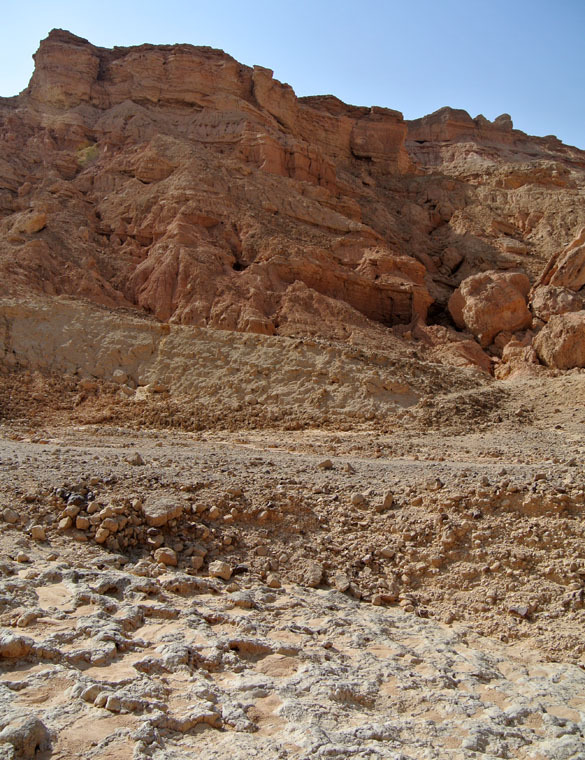 MITZPE RAMON, ISRAEL–It is a tradition with the Wooster Israel expeditions to spend one day with our colleague Yoav Avni geologically explore areas beyond those associated with our present research topics. This is the way we plant seeds for future research endeavors — and Senior Independent Study projects. Today we went to four sites, which I will present in brief vignettes. Our first stop of the day was in Nachal Paran at N 30.32329°, E 34.96388° about 35 km southeast of Mitzpe Ramon. The image of above is from our outcrop looking up at the faulted boundary of a large graben in which the valley is formed. Preserved within this down-dropped structure is a thick section of the Lower Miocene Hazeva Formation. 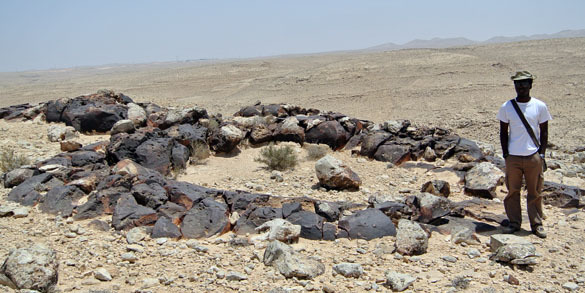 Most of the Hazeva consists of reddish sandstones and conglomerates deposited by a very large river system that was flowing from the Arabian Peninsula into the Mediterranean. There have been a variety of African-derived mammal fossils in this unit, including elephants and giraffes. The unit of interest for us today is the gray rock at the base of the above image. It is a thin limestone unit no more than one meter thick. Its top has a scalloped pattern that may be due to ancient karstic weathering when the river deposited muds and gravels upon it. It appears to be a lake deposit formed just before the river moved into the region. 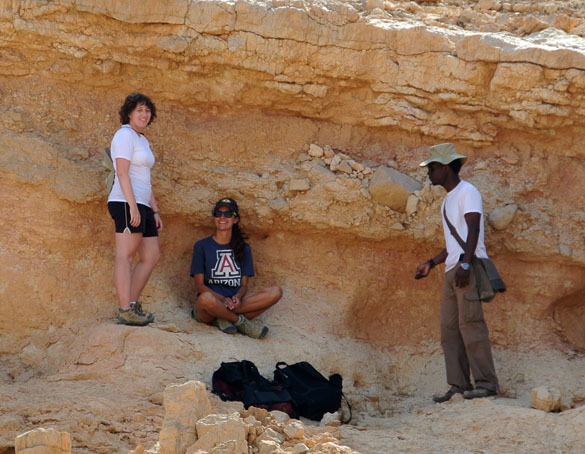 Team Israel 2013 is here looking at a cross-section of the lacustrine (lake-formed) limestone and the sediments beneath it. One of the issues is how do we know that the limestone was formed in a lake. The best clue is the occurrence of tiny high-spired gastropods throughout the matrix. 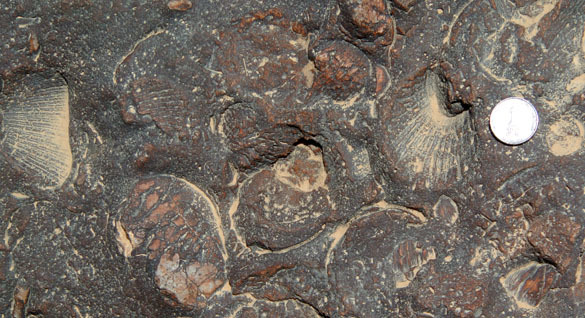 Another would be the presence of trace fossils that may represent the horizontal trails of snails and/or freshwater arthropods like isopods or insects. There is a pervasive pattern of vertical tubes that remains mysterious. Are they trace fossils or some sort of diagenetic phenomenon? A further question is why this lake was there in the first place considering that it sits in a section almost entirely formed of typical terrestrial siliciclastic sediments. Does it represent a brief climate change? A tectonically-induced change in the local hydrogeology? Plenty of questions here for future geological researchers.